Ready to Stop Chasing Your Tail and Get Val’s Help Resolving the Issues in Minutes, Not Years? If Val could wave a magic wand during your session, what would you like to have happen as a result of working with her? Val works by appointment only with clients who meet her criteria. All her animal sessions are conducted by phone. Val isn’t just an animal communicator because her focus is on resolving problems, and sometimes just talking with your animal isn’t enough. She’s also interested in going the next step to help you be where you want to be. If you’re just looking for someone to communicate with your animal, you may want to look for someone else. Email support – Optional depending on the Consulting Plan you choose. Digital Recording: Optional service. All calls may be recorded digitally (audio digital links only), fee may apply depending on the Consulting Plan you choose. And by the way, you do not have to have an animal to work with Val. More than 40% of her clients do not, but have found her work so valuable, that they continue to work with her on various life issues, such as relationships, career, performance and health. What Results Can You Expect By Working With Val? Val promises that if you don’t agree that by the end of your sessions you have these 4 Fundamental Results, then she’ll happily refund your money out of her own pocket. You have her word on it. No other animal communicator, trainer, intuitive, healer, behaviorist or pet psychic offers 4 Fundamental Results – 100% Guaranteed, or your money back! NOTE: No one can force your animal to change if they don’t want to, so please note that Val is not able to promise that she can make them change according to your desires. Your results are also highly dependent on your own actions or inactions. 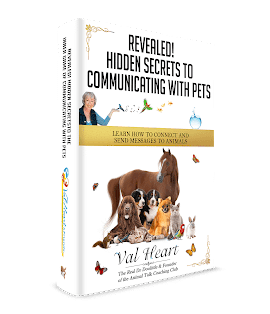 Val’s promise is to connect and communicate with your animals accurately, to work towards creating balance, healing and harmony, and to foster better understanding between you. because she’s not just another animal communicator. Ready to find out how you can work with Val, or if she is the right consultant for you? Val has a variety of different programs and services that may or may not be right for you depending on your situation and what your needs are. Before deciding whether working with Val is a good fit for you or not, let’s explore a bit further what’s going on for you, what you’re struggling with, and what you’re hoping to accomplish. Like a doctor, Val cannot give you a prescription without a diagnosis. Val can more accurately determine if and how she can best help you in a Complimentary Meeting. If she feels she can help, she may recommend the Plan or Program she feels would be the best fit for you and your situation. And at that time she’ll be happy to tell you about all of the program components, including the investment. How does that sound? Because Val wants you to work with the right consultant for your needs, she wants to get to know you and your needs before determining whether you are a good fit. Together you can get a better feel for whether working with Val is right for you – or not, and for Val to determine if you fit her client criteria. Please note that Val will not be working directly with your animals during this time. Apply now for a No Obligation, No Strings Attached, Complimentary Happy Animal Assessment Evaluation Meeting so that together, we can determine the best possible way for you to have exactly what you want. Next, if after your Complimentary Meeting you’ve decided you are a good fit to work together, you’ll process your payment and get your first appointment scheduled in the soonest available opening. You’ll receive an email with a link to our on-line appointment scheduler. You then choose a time that works best for you from the times available on Val’s schedule. First, fill out Val’s BodyMind Assessment Questionnaires (one for you, and one for your animal as appropriate). Then fax or mail them back when you’re done. Instructions are on the Form. You can fill out as much or as little information as you wish (your information is kept strictly confidential and will never ever be shared with anyone else, period). Remember that the more information Val has, the faster you’ll see results and the more targeted your session will be. Questionnaires should be sent to Val at least 24 hours before your scheduled appointment. Then, send Val a picture of your animals — email or snail mail is fine. They don’t need to be glamour shots, just pictures you like of them. She would like to see their face/head at a minimum, and their body if possible. About CRISIS & EMERGENCY WORK: Because Val is usually booked so far in advance with a waiting list, she is unable to accept crisis or emergency work. For that reason, she encourages you to get on her schedule as soon as possible — OR, she may be able to refer you to someone else. She also has a Waiting List and will be happy to put you on the list in case something opens up sooner. Is a session with Val the right fit for you? The people who get the best results are those who feel stuck and are ready to move forward in their lives, are spiritual seekers, or who are animal communication students wanting to deepen and develop their skills. Does Val work with animals who have passed on? Yes, she does. She will work to reconnect you with your lost friend, help you cope with grief and loss, and help you find completion and peace with their passing, so you can move on with your own life without feeling crippled by guilt, pain and the agony of losing your forever friend..
How does Val’s sessions work, does she come here or can she work over the phone or through Skype? All animal sessions are conducted over distance (using telephone, Skype), email and/or ‘solo’ (where Val does the work and sends you the results afterward either through email or a digital recording). What if I have a LOT of animals, how does Val work with groups? Val works with as many animals as you like in the time we have available. Depending on how many animals you want Val to work with and the seriousness of the issues you’d like her assistance in resolving, you may want to plan on taking advantage of at least 3 focused sessions to save money, energy and time. In order to create the greatest shift and changes as quickly as possible for your and your animal’s health and behavior, Val wants time to go as deep as is needed to get the best results. Do you live outside the United States? Don’t worry. We have an easy solution to help you connect with Val for your appointment using Skype. If you live outside of the United States Skype may be used for consultation calls at no cost. It is a free and easy to use computer-based phone system that allows people to connect to each other from their computers from anywhere in the world. Simply visit www.skype.com to download your free software program and to create your skype account. Once you have created your account simply give Val your Skype ID and she will initiate the phone call at the scheduled time. (You will need a microphone for your computer, an inexpensive one works fine!) Val’s Skype ID is Val.Heart. Understand that your appointment reserves time on Val’s schedule. If you don’t show up for your appointment and don’t give appropriate advance notice, your investment will not be refunded. If you do need to reschedule, Contact Val a minimum of at least 2 full business days (note that her Business Week is from Tuesday through Saturday) before your session date so she can offer your session time to someone else who needs it. Need a little help or have more questions? Click here to Email us, or If you would like to speak to someone about scheduling an appointment please contact Dona at 951-672-2968.